WASHINGTON — A few weeks ago, the bespectacled Alex Fournier—about 5-foot-5, balding, attired in a nice black, maroon-pinstriped suit—was sipping refreshments during a special reception before the annual Thurgood Marshall College Fund gala saluting historically Black colleges and universities. At first glance, one might think Fournier was a professor for one of TMCF’s member HBCUs. He is White and appeared older than many of the youthful Black students—about 400 of them milling about at the reception—from HBCUs around the nation. The assumption would be incorrect. 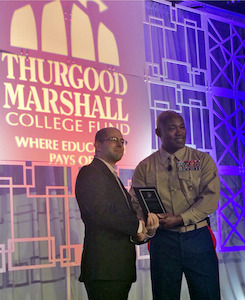 Alex Fournier, left, receives an Excellence in Leadership award from the U.S. Marine Corps in partnership with TMCF at the Leadership Institute. Fournier is a student, too. He also is a military veteran, having served in the Marine Corps in Iraq in 2008 and in Afghanistan in 2010. Now, Fournier attends Norfolk State University, an HBCU. He’s an electronics engineer major, an exhaustive as well as exhilarating undertaking, for sure. Six years ago, he was a key member of an infantry/artillery unit searching for improvised explosive devices in the most dangerous of circumstances in the Middle East. In the fall of 2016, Fournier was among about 1,300 participants attending the annual TMCF Conference-Leadership Institute that included a festive gala/awards show, hosted by talk-show host/comedian Wendy Williams, which capped the four-day event. Fournier is an undergraduate student. At 27 years old. And married, with children. And a war veteran. A White war veteran. Fournier’s wife, Kate (short for Ekaterina), is an aviation technician in the U.S. Navy, stationed in Norfolk. Kate, who is from Russia, is a troubleshooter, specializing in the avionics of Navy helicopters. Her job stability allowed Fournier to check out colleges. Enter Norfolk State and its location, location, location. Norfolk State is a co-ed, liberal arts school with an enrollment of approximately 7,000 students and is a member of the TMCF, which represents 47 mostly public HBCUs. Norfolk State also offers master’s degrees in electronics engineering. In fact, NSU offers the only baccalaureate program in the state of Virginia in the field of optical engineering. Fournier is originally from Warner, N.H., a town of about 2,800 in the southern part of the state. He attended an all-White high school from which many of the students don’t go to college, choosing instead to work in blue-collar jobs, such as construction and service occupations. Suffice to say, “I’m probably the only person from Warner, New Hampshire, attending an HBCU,” Fournier said with a chuckle. According to a 2015 study conducted by Dr. Marybeth Gasman, director of the Center for Minority Serving Institutions in the graduate school of education department at the University of Pennsylvania, approximately 25 percent of the nation’s 105 HBCUs feature at least a 20 percent non-Black student population. By comparison, in 1950, Black students comprised nearly 100 percent of HBCU enrollment; in 1980, they represented 80 percent of total enrollment. That changing demographic is crucial as many cash-strapped HBCUs face stiff pressure to increase student enrollments, thereby boosting revenue. Remember the history: HBCUs first were created after the Civil War—mostly in the South during Reconstruction—as a mechanism for freed slaves to learn to read and write without fear of retaliation, to acquire a skill or vocation, and to avoid having to admit them to predominantly White colleges. Changing times from the original core mission, indeed. With that, let’s meet the “Mac,” gleaned from his middle name McEwan. That’s the nickname for Carlton Baldwin, a 63-year-old U.S. Navy veteran. His persona is reminiscent of the movie archetype, you know, those no-nonsense, straight-to-the-point, gruff drill instructors and boot camp sergeants we’ve seen in Hollywood’s version of U.S. military life. Baldwin admits he wasn’t the most progressive person racially while growing up in Aiken, S.C., where, in the early 1970s, as a White person, he was thrust into the throes of the transition from southern segregation toward open desegregation, especially in the local school system. Now, he is the military liaison in the department of student affairs at Savannah State University, the oldest public HBCU in Georgia. Savannah State, for example, has an enrollment of 4,500 students, with 82 percent Black, 8 percent Hispanic and 4 percent White. Its special non-racial asset: The school boasts the state’s only marine science curriculum that features on-campus, deep-water access—i.e., the ocean. Baldwin’s specialty: Helping military veterans complete their paperwork and other requirements for college enrollment so they can receive their updated post-Sept. 11 G.I. Bill educational benefits program, which, by most accounts, is light years ahead of the Veterans Affairs’ much-maligned medical system. When Baldwin describes his collegiate life, his job at Savannah State is to prevent incoming military veterans from stressing out. Baldwin says the military taught him important lessons about race relations. In fact, the U.S. military has been a test-case laboratory for years involving issues of race. On July 26, 1948, President Harry S. Truman signed Executive Order 9981, which abolished racial discrimination in the U.S. armed forces and ultimately resulted in the desegregation of the military. Sixteen years ago, he followed his wife to Savannah, when she accepted a job as a children’s librarian. Five years ago, he saw an ad for a job as the head of military affairs at Savannah State. Baldwin had worked previously as the commanding officer of the Naval ROTC program at SUNY-Maritime College in Bronx, N.Y. He applied for the Savannah State gig, and the rest, as they say, is history. As for the armed forces lifestyle, he explains, “In the military, we have a job to do. We have women in the military now, people of all races. So if you have a problem with them, you have to put your (nonsense) and your little prejudices aside. We have a job to do. Norfolk State’s Fournier already has procured a post-college job, one that he found after attending a job/career fair at the university in September. After graduation in May 2017, he’s scheduled to begin an engineering position in Panama City, Fla., for NAVSEA, the Naval Sea Systems Command, the largest of the Navy’s five system commands. Just in time as his wife will finish her five-year hitch in the Navy. Savannah State’s Baldwin, on the other hand, tirelessly works to get his military veterans to Fournier’s stage of development in the educational system. He acknowledges that motivation can be an issue. And there are the cultural, historical and socioeconomic differences. However, one aspect of post-veteran life is a commonality for the majority of veterans, such as Baldwin and Fournier—regardless of race or creed or gender. The thank-yous. “I don’t broadcast my military service,” Fournier said. “I didn’t join to hear people say, ‘Thank you for your service.’ I joined because I could handle military service and being deployed. The students—Black, White, Hispanic, other races. The same for Fournier’s professors, whether American born or internationally trained, from such countries as South Korea and Egypt. With that, these veterans of different colors, hues and backgrounds, in turn, thank the HBCUs—after their service.